It's has been one week and one day since my last confession. Sometimes it amazes me how fast weeks go by. Still, there are other instances where they sort of putter slowly like they are about to run out of gas. Honestly, I'm not sure which I prefer. I don't care for them to drag on, but sometimes, honestly it scares me how fast life goes by. I confess that I would be okay with slower weekend and faster work weeks. Big surprise huh? Last night when I should have been doing my week's confession I was instead watching TV with my wife. Now, I say I should have been doing my confession, but in fact sometimes you just have to go with your gut about what you need to do. I felt that I needed to be spending time with my wife. I don't regret it, but I do admit that sometimes our lives have to have an element of flexibility to them that frees us from the rigidity that we often associate with the pursuit of success in some other endeavour. Life is not always kind to us humans. As a parent, this is something that I felt was important that our children understand in such a way as to not be bitter about it. I continue to have to remind myself of this fact from time to time. It is in recognizing this that we can sometimes spare ourselves undue frustrations. I believe in Christianity and I think most other religions as well there is a feeling that it is in the context of low points in our lives that we can appreciate the high ones more. Sometimes we have to stop to smell the flowers. 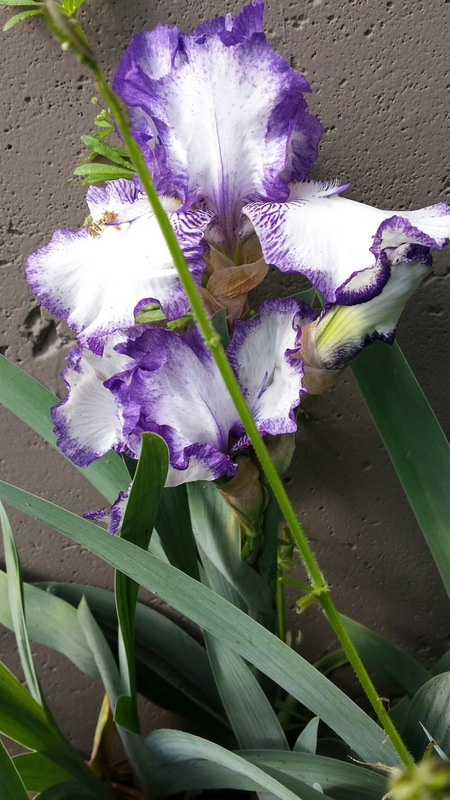 The picture above is an Iris in our yard. I live for these to come up each spring. It may seem silly, but they bring me much joy. We did not plant them, they were just here when we moved her 12 years ago. At out last home, they were bleeding hearts that came up each spring that had the same kind of impact on me. This past week I found myself noticing for one reason or another that people around me, perfect strangers seemed to be more thoughtful during the day. Holding doors, more courteous driving, these kinds of things. The latter, driving was especially notable because I swear in general Kansas City has some of the rudest drivers anywhere. At least anywhere I've been. But this whole kindness thing is surreal against the backdrop of what has been happening in Baltimore and other cities around the country. Being a big baseball fan, I also found it eerie that the Orioles and White Sox played a game without fans in the ballpark today. First time ever in MLB history. I have the people in Baltimore in my thoughts and prayers. Today, the symphony played an outdoor free concert, libraries have expanded hours as a way to offer people options of things to do off the streets. It is nice to know that there are people in the city trying to be positive and proactive. These are difficult times for America. We all need to be more compassionate and understanding. I confess that I am trying to focus on this personally. That's it for now. May kindness follow you wherever you go this week. It's been one week since my last confession. A week in which I was both fatigued and emotionally energized. It's a strange feeling. This was largely a result of the AWP Conference. The experience was mostly a positive one - it was the focus of most of last weeks confession so if you did not get a chance to read it, click here . So this week, I've turned my attention forward. The future, near and beyond. Short term the month is coming to a close soon and I was looking at my drawing entries and I'm underwhelmed. There are so few entries. I realize that this year I was not listed right away on the master list but I really would like to see more people enter. I confess that I am bothered by how few entries there are. I guess coming off AWP I felt a little mischievous and this translated into the tattoo above. 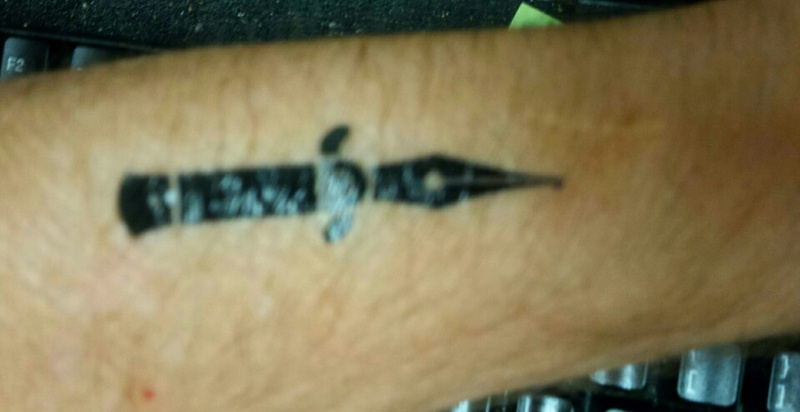 I confess that this is a fake or temporary tattoo. I sent a text to my daughter Meghan with the above picture of it attached. She replied, Nice! Now go get a real one. So this week how many people a the office have said anything about it? Zip! None! I confess that I am totally floored that no one has mentioned it. I starting to feel totally invisible to the worlds. It's been several weeks since my last confession, but let me focus on this past week. It's been 7 days away from my office, two Delta plane flights, over 700 presses, literary journals and writing organizations, over 550 readings, panels and craft lectures, too much coffee and Diet Coke to count, notes and writing and more writing, faces I'd never seen, faces I wanted to meet for the first time and faces I didn't get to meet. A week of much more walking then I would have done in a week of judicious tread mill sessions, a swim, a hot tub, more tweets than a hundred birds could do and little rest. This was my first time at AWP. Yes, I confess I was a newbie. It was also my first time in Minneapolis and St Paul (St Paul is another story). I confess that I was overwhelmed before I left. How do you whittle down all the possible panel presentations none of which are repeated without sacrificing numerous ones you want and or should be at? My schedule was shifting sand right up to the presentation in some cases. I will give my wife credit for helping me ask myself questions to narrow the list somewhat. It was nice that Cathy too enough interest to engage in conversation about the options. She often has an ability to look at such things without as much emotion and ask good questions that can affirm one of your selections or in the alternative provide a significant rational to accept an alternative. It was overcast on our decent into Minneapolis and I was on an isle seat anyway. But I confess I only ever saw one lake in the state that boasts of Ten Thousand Lakes. I know, what are the odds? While it was my first time in Minneapolis, it was also my first time in St Paul. I confess that I deboarded the blue line and caught a green line light rail and road to it's stop. This mysteriously placed me in St Paul. I was certain of my mental notes that I had done what I was to do, but alas I confess that the embarrassing mistake delayed my arrival at my hotel by a couple of hours. No that I think about it, this means I was actually twice in Minneapolis.I got on the second train where I should have made my departure for my hotel only six blocks away. I will give the city kudos for their public transportation. The light rail is efficient (if you know what you are doing) and affordable. It intigrates well with their bus service as well. The event is both draining and inspiring. If you were to several panels back to back, there was not much time to do much but a quick restroom break and hustle to the next panel. I confess some of these were quite different than what I might have expected. That is not to say they were bad, just surprisingly moved on the subjects in ways that were different than I might have assumed. 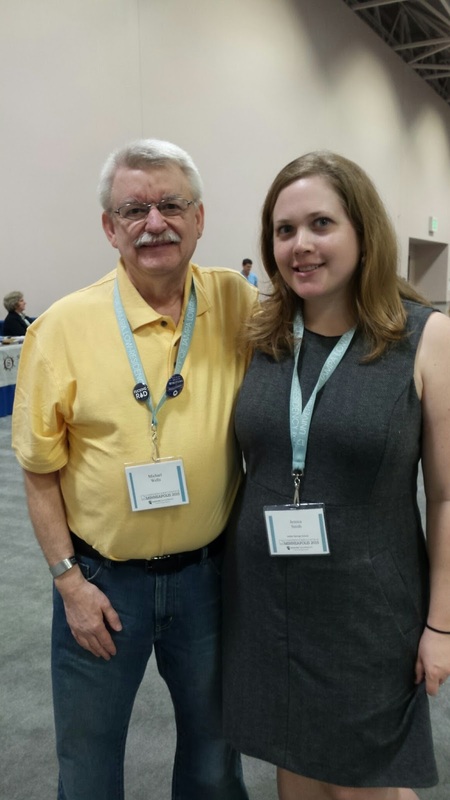 A Surprise: I was taken pleasantly by surprise to learn from a couple of presenters that they had taken different routes in their writing path than a MFA. I confess that this was actually a liberating experience. Understand if I had my life to do over (there is that catchy no do-overs thing) I would have likely considered another path that would have involved an MFA. At my age this is not really a practicality. But is was freeing in a way to see these people participating and seemingly positive signs that they did not let such things stand in their way of writing and achieving success. This makes a third book by Mary Biddinger that I own. She is actually holding up Barn Owl Review - which I meant to pick up a copy of and will now have to order. On the right I am pictured with poet Jessica Smith. Jessica and I both share a passion for birds. I am anxious to delve into her most recent book Life Lists which forms the backdrop for this work. 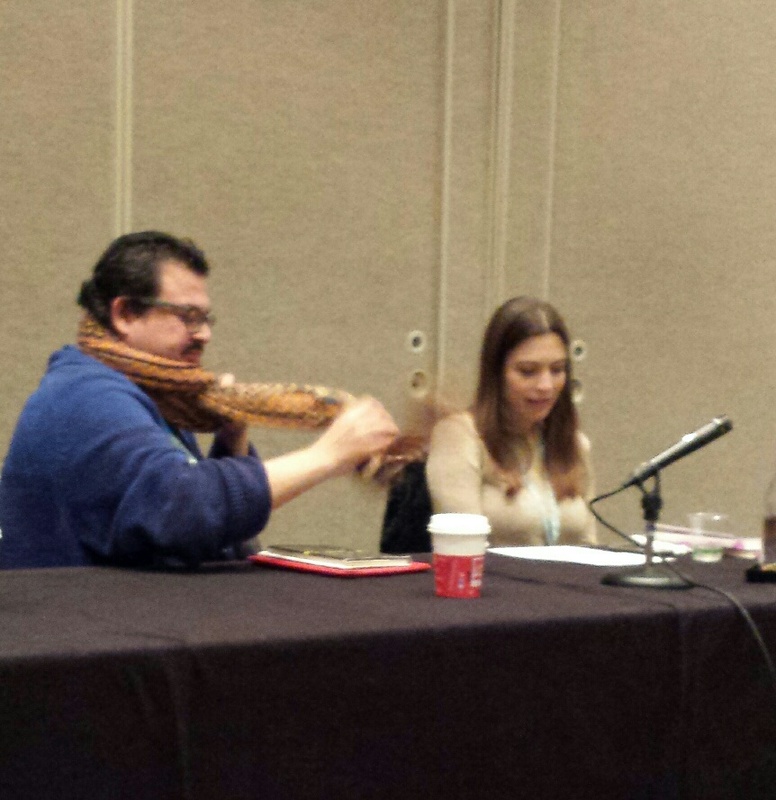 Pictured on the left is Eduardo Corral and Sandra Beasley who both read at a 10th Annual reading of the Best New Poets anthology. They were two of the four readers. All four were especially worthy of their selection for this. I've read Beasley's blog for years but had never met her until this reading. She has a compelling voice that is fresh and flourishing. You want to read more of her work upon the moment she is finished reading. I confess the event was not without disappointments . One of the biggest was missing the opportunity to meet Carolyn Forche and get a signed copy of one of her books. I did not realize that her book signing was not a part of the scheduled book signings that were associated with the book table set up in the lobby area. My mistake was further complicated by people at the tables giving me two different days and times for here and as those times approached I was told something different. Finally I realized that she signed at a table inside the book fair and the time had passed, thus I was never able to connect. Carolyn is a favorite of mine and it would have been a big deal to have met her and gotten a signed book. After the fact disappointments - local poet Maryfrances Wagner and I each realized after returning home we had both been there and could have a lunch or a glass of wine together. I also realized yesterday the Andrea Beltran was there - again after the fact. There were a number of poets from the Northwest Pacific area that I would love to have met, skipped this years event. All of who I consider magical writers who are doing something very right But life goes on. 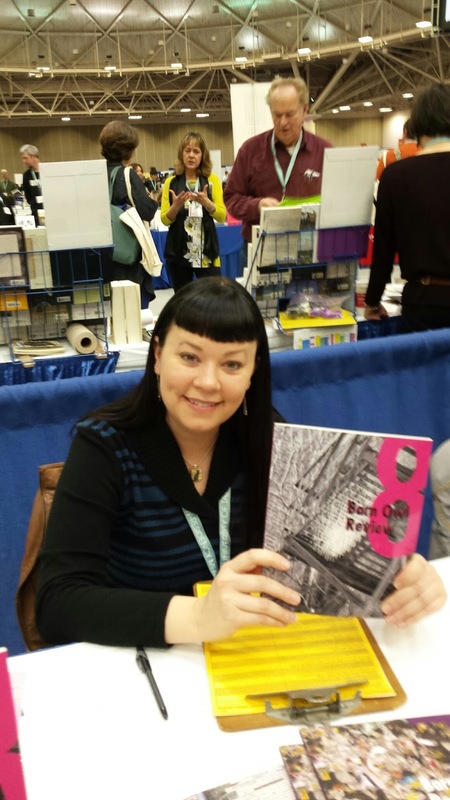 As the last rites are administered to AWP15 let me add a few closing thoughts. If you were from Minneapolis and out and about town after hours but may have appeared that a zombie apocalypse was occurring as there were writers walking every street with their eyes looking totally zoned out. 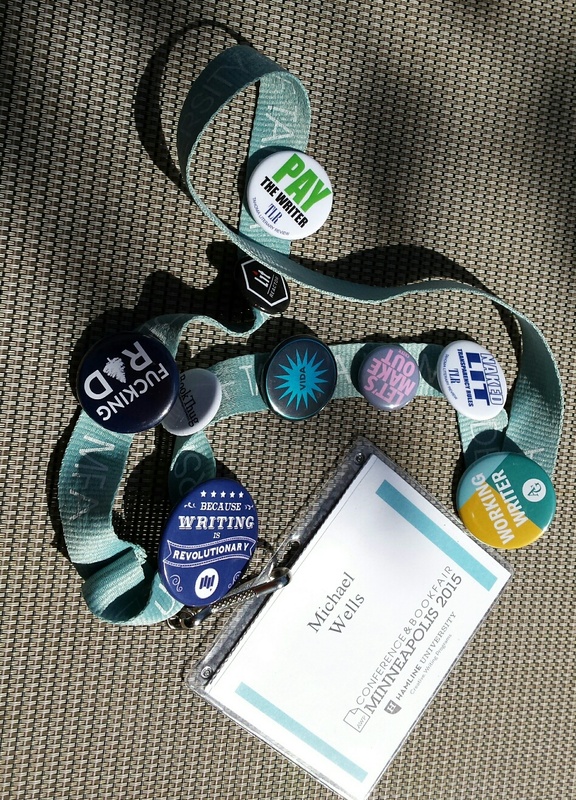 And yes they were writers not Minnesotans - as evidenced by their name tags on lanyards and or AWP tote bags. I cannot judge the WiFi against past conferences but it was spotty at best. I have no idea how many tweets were hung up in the tweetmosphere because the sender walked ten steps while tweeting. AWP is not going to make me a superior writer, but it has given me another window to look through. It has made me physically tired, but alas it has infused me with a charged mental attitude and a lot of new directional thinking. There is no substitute for being immersed in and among remarkable writers and exceptional poetry. Also, bringing home lots of books and journals to feed the reading experience. And I believe poets at al levels have a need to read. I was glad to see and connect with advocacy groups for the arts and VIDA. So many poets in boots. Just had to throw that out there. Is this the replacement for the beret? And last, I was taken by the number of mothers with children, infants. I know taxing the conference was to me. I can hardly imagine the balancing act these women had to preform. I applaud their commitment to writing. And yet I know for every one that was there with child there were untold numbers who wanted to be but it didn't work for them. I'm thinking out loud here but I wonder if there has ever been consideration to child care options for the event? Maybe this has been explored. If not, it should be looked at. And surely dads and other family members, can offer a more supportive to young mothers. I do what to give a shout out to my wife looked out for me from afar.She was concerned that I would forget to eat or something. I just know she was always concerned about it. Breakfast at my hotel was pretty awesome. The first day I shot a picture of my platter and messaged it to her to ease here mind. Afterwords, I realized I should have done like kidnappers and put the front page of the morning paper in the picture so the date was prominently displayed. My mind is still in overdrive. Hopefully it will slow a bit and my energy level increase to where they are working in tandem soon. I have poems to write! Listed below are links to each participating site. Visit them all! j. Donna Vorreyer: Put Words Together. Make Meaning. 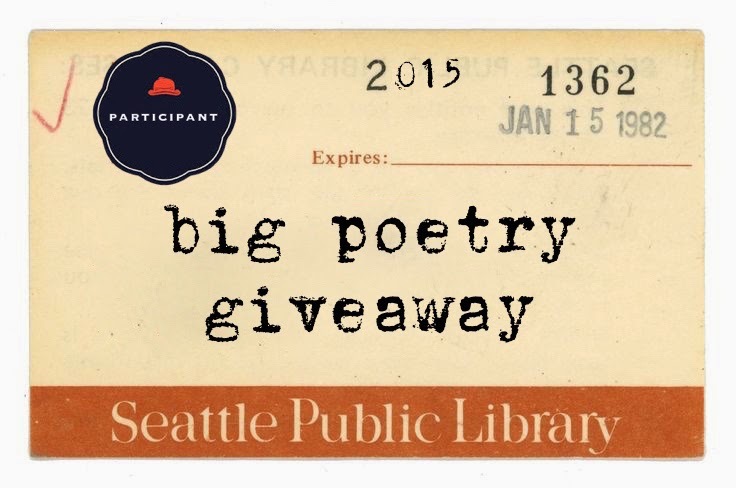 For the second year I am participating in the Big Poetry Month Giveaway. This event started 6 years ago by poet & writer Kelli Russell Agodon. There are a list of participants at the at the link above so there are many opportunities to win. But as the say, "You can't win if you don't play." Amy is a local poet in my community that I have know for a number of years and this is her first published work, a chapbook from 2011. 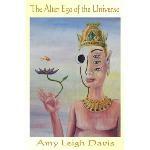 More about Amy and the book can be seen here in an interview I did with Amy soon after publication. but brought her international notoriety. If you have never read this book it is a must read for those especially interested in writing from the vantage point of sharing the complexities of social strife. These are the two books I am giving away. If you are new to this blog site here s a little about myself. My name is Michael Allyn Wells. I live with my wife and three dogs in a suburban community of . Kansas City, Missouri. (That's the big city. Surprisingly many visiting the city for the first time think they are in Kansas. Our smaller sister city is on that side of the of the state line). I'm an avid baseball fan and to be more specifically a San Francisco Giants fan for nearly 40 years which made for an interesting situation during last year's World Series when the Giants met the Kansas City Royals. I love reading and writing, sipping an occasion glass of wine. I prefer my wine white and my coffee black. If you would judge me on the basis of my musical preferences you would think I was stuck in the 60's-80's. 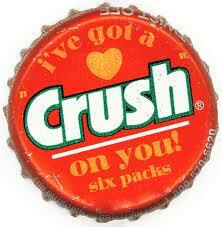 I loved music by Chicago, Crosby Stills & Nash, Bread, Three Dog Night, Air Supply, etc. I love the saxophone and I'm a big fan of Kenny G (much to the dismay of my grown children). Some of my favorite desserts are German Chocolate Cake, Cheese Cake (no Raspberry sauce please) and Black Walnut Ice Cream. Thanks for stopping by and God Luck! If you've gotten this far then surely you want to enter the drawing. It’s simple too. All you have to do is just leave your name and email in the comment section of this post. This drawing is open to everyone through ALL OF APRIL 2015, National Poetry Month! If you'd like to be entered, please leave your name and email address by midnight (Hawaii time), APRIL 30th, 2015 below in the comment section of this post and I'll be randomly choosing all lucky winners the week of May 1st, 2015. You can find a list of all the participating blogs here.